Great pillow, well made with nice color. This cheerful and sweet throw pillow is an ideal decor piece to add to your home. 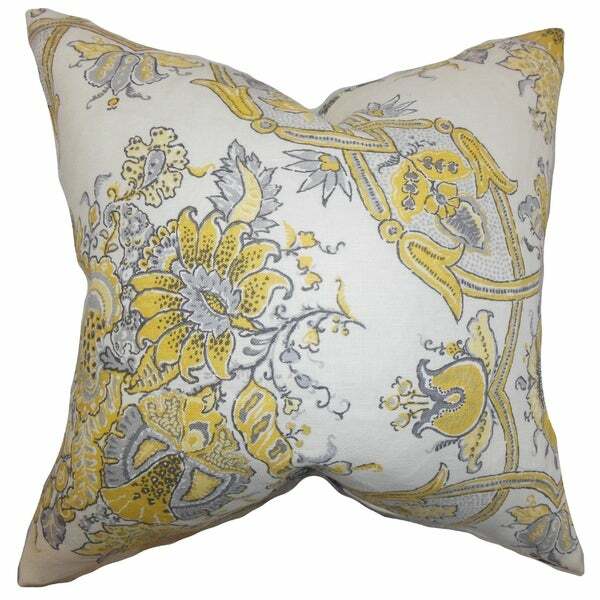 Adorned with a floral pattern in shades of yellow,grey and white. Brighten up your sofa, bed or couch with thissquare pillow. Hidden zipper closure for easy cover removal. Knifeedge finish on all four sides. Reversible pillow with the samefabric on the back side. Fill materials: 5/95 down feather. This item is made to order and each pattern may be cutdifferently. If buying two of the same item, slight differencesshould be expected. Note: Color discrepancies may occur betweenthis product and your computer screen. Got this to compliment my new sofa. Love it.